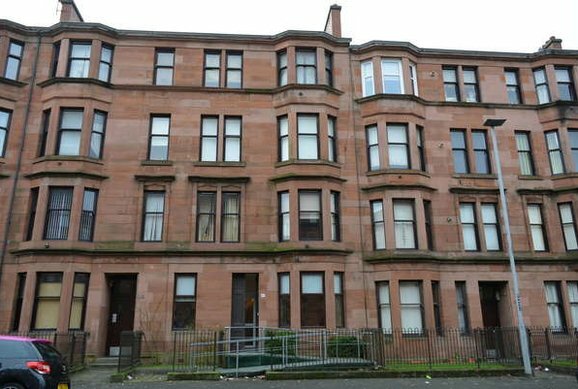 29 year old Helen Puttock lived with her mother and two young children, David (5) and Michael (1) at 129 Earl Street, Scotstoun. Helen’s husband George was a service man who she had met when visiting her brother in Surrey, the pair fell in love instantly and were married soon after. Helen followed her husband in his postings, spending some years in Germany. However, Helen found the life of an army life lonely and isolated, and persuaded her husband to allow her to return to Glasgow with the children until he could get a posting closer to home. The couple kept in touch by letter, and George made every effort to visit his family when leave permitted. It was during one of these trips that Helen announced to George that she was going out dancing with her sister, Jeannie Langford, on the night of Thursday 30th October 1969. George told Helen that he didn’t think it was proper for a married mother to go out dancing without her husband, but Helen insisted it was perfectly normal, she was hardly going out on the pull after all, she was only going out for a bit of a dance with her sister. George was eventually persuaded, he gave Helen ten shillings to get a taxi home to ensure her safety. 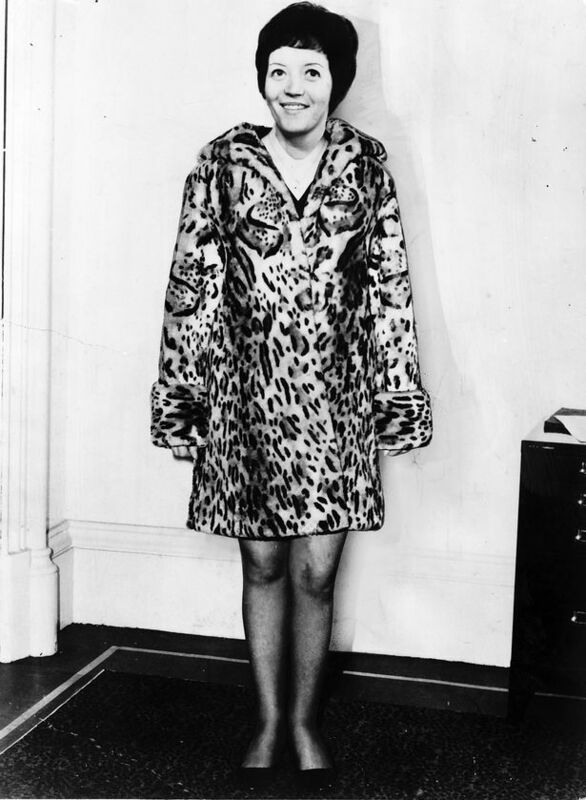 So it was that Helen, dressed in a black sleeveless dress, brown tights, a faux fur coat, black shoes and carrying a red purse, bid her husband and children good night and hit the town with her sister. The pair first took a bus to Glasgow cross around 8pm and headed to a number of bars. They made their way to The Traders Tavern where they had arranged to meet two other friends, Marion Cadder and Jean O’Donnell, where they had a few drinks before joining the queue outside the nearby Barrowland Ballroom. Once inside the two women made straight for the bathrooms to touch up their make up before making their way to the dance floor. 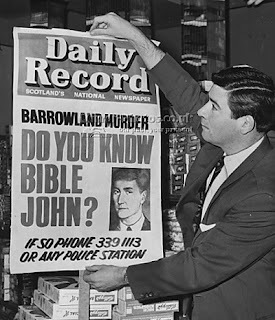 Despite the heavily publicised murders of two young women connected with the Barrowland, there was no sense of great concern amongst the patrons. One woman who attended the Barrowland at the time told an author years later: ‘That sort of thing (murder) always happened to someone else, there was always more to it, it never happened to normal folk did it?’ Helen and Jeannie were just that, normal folk. Jeannie had taken to the dancefloor, but Helen was more reticent, standing at the side, but soon Jeannie noticed that her younger sister had attracted a companion and was dancing with a tall, handsome man who stood out because he seemed ‘suave and a little sophisticated.’ Jeannie had also attracted company, a man who offered to be her dance partner for the night. When asked about himself, he was vague and Jeannie surmised that he was likely married, but she didn’t mind, she only wanted to dance anyway. Jeannie didn’t believe the two men knew each other previous to that evening, she reported that her John even remarked that he didn’t like the other John. He told her he found him strange and full of himself, he wouldn’t look him in the eye and he felt he was hiding something. He believed he was a cop, he had that manner. 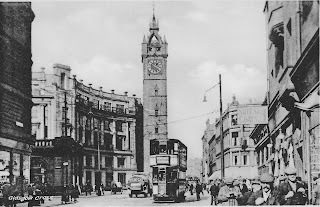 The four made their way out of the dance hall and walked along Gallowgate towards Glasgow Cross. At London Road, Jeannie’s partner bid them goodnight, telling the group he was going to catch a bus from George Square to Castlemilk. At the cross, Helen, Jeannie and ‘John’ got into a taxi and began the 20 minute journey to Scotstoun. Jeannie says that during the journey his manner changed again, be became moody and aloof. Jeannie recognised that he saw her as an obstacle between himself and Helen. Sensing his hostility toward her, Jeannie tried to lighten the mood by asking him questions about himself. John gave little intimate detail away, he told them that his family had a caravan in Irvine, and that he played golf. 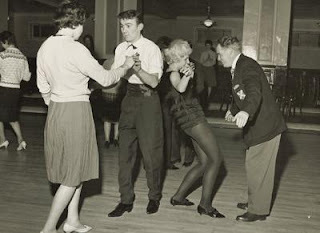 When asked if he enjoyed dancing, his answers took a more sinister tone, he talked of his disapproval of married women going to the dancehalls and spoke angrily of ‘adulterous women’ in general. He also mentioned having a sister but immediately tried to retract this detail by talking of a foster home. When asked about what he did at New Year, he replied that he didn’t drink but preferred to pray instead. He would contradict this statement by later declaring he was agnostic. Yet, he began to quote from the bible. While he was quoting from the Bible the taxi was passing an area known as Kingsway, where there were high rise flats. He mentioned something about his father or another relative having worked there. It is known that at some point a foster home was located on the site. This local knowledge coupled with his earlier comment about foster children, led some police to believe that he had been a foster child. Eventually the taxi drew up in Earl Street, it would have made sense for Helen and John to alight first because Jeannie’s home was further on in Kelso Street. However John insisted that Jeannie be dropped off first, and instructed the driver to continue to Kelso Street. At the roundabout at Kelso street, Jeannie bid her sister goodnight, saying ‘I’ll maybe see you next week” but John slammed the taxi door shut mid-sentence. The driver was later able to confirm that the taxi pulled up at 95 Earl Street a couple of minutes later, the woman had got out the cab, and the man, who he assumed to be her partner, paid the fare. He said the man seemed annoyed with Helen because she had immediately started to walk away from him as she got out of the cab. He drove off, and other than the killer, was the last person to see Helen Puttock alive. 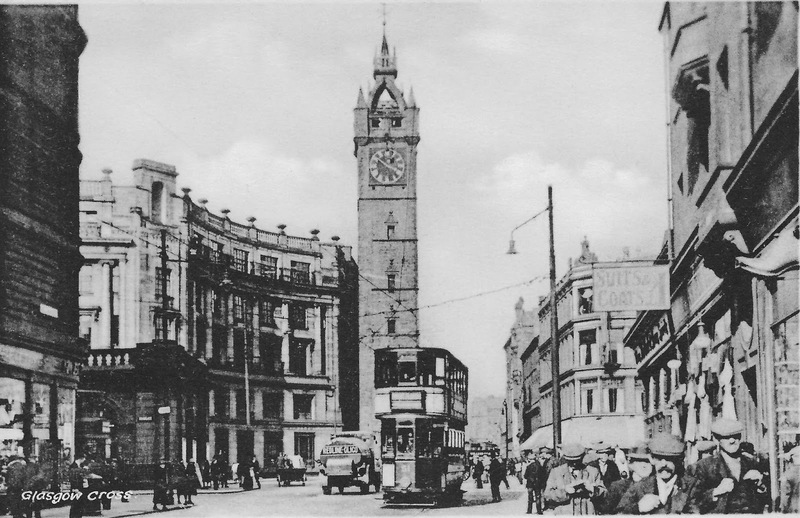 At 2am a no.6 night service bus was travelling along Dumbarton Road in the direction of the city centre, close to Gardner Street/Fortrose Street the bus stopped to pick up a man with a dishevelled appearance. The same man had been seen by another witness walking quickly up Dumbarton Road. On the bus, a passenger, driver and conductor noticed that the man’s jacket was covered in mud, and that he had a scratch just below his eye. They reported that the man was clearly uncomfortable with his appearance and made efforts to disguise it. It was clear to those who saw him that he had been involved in some sort of physical altercation. 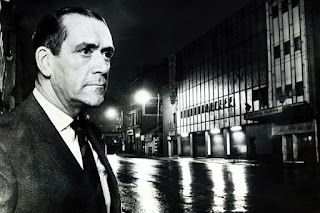 At the junction of Dumbarton Road and Derby Street, the man stopped the bus and got off, disappearing into the night. 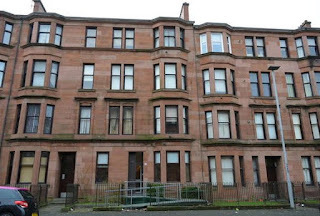 At 7.30am Archibald MacIntyre of 95 Earl Street was taking his dog for a walk, he descended the back stairs and out into the enclosed backyard of the tenement. The dog began sniffing what Archibald believed to be a bundle of rags, he would later recall: ‘When I went over to the rags I got a terrible shock to find it was a woman’s body…She was wearing her coat but it had been pulled roughly up over her head.’ Around the woman’s neck was tied one of her own stockings. Archibald ran to the nearest telephone box to alert the police. The police noticed that dead woman had abrasions to her jaw and the side of her head, her mouth and nose had dried blood running from them. There was extensive bruising to the face, which was unrecognisable. Her dress and coat were torn, a god chain she had been wearing around her neck had been torn from her and lay broken nearby. As in the previous murders, the victim’s handbag was missing. Police found a cheap cufflink in the mud which they believed may have been torn from the attacker’s clothing by the woman as she tried to defend herself. The victim, like Patricia Docker and Mima McDonald, had been menstruating at the time of her murder, and a used sanitary towel was found tucked beneath her armpit, no doubt placed there by the killer himself. The police noticed bite marks on her wrist. Detectives arrived and tried their best to preserve the crime scene from the local residents who were crowding into the courtyard and, innocently, interfering with evidence that may have been crucial to the detectives. For the third time in eighteen months the police were left with an unidentified corpse and few leads as to her identity. Police set up an incident caravan at the door of number 95. Door-to-door enquiries led to a witness who recalled hearing a woman cry out in the early hours of the morning, but dismissed it as drunken revelry at the time. Later in the morning, George Puttock arrived at the incident caravan and told officers that his wife hadn’t returned home from a night out dancing at the Barrowland Ballroom with her sister. He was asked questions about what his wife was wearing when she went out, afterwards detective Joe Beattie took him to one side, he was later to recall: ‘I will never forget him putting his hand on my shoulder and saying: “I’m sorry son, your wife’s been murdered”. 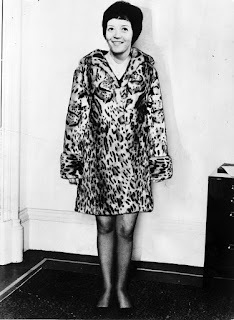 Jeannie Langford was notified of the murder shortly after George Puttock, she was so distraught that it took some time before officers could get a statement from her. 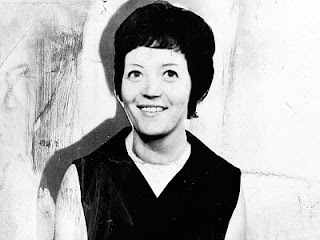 It was not lost on the detectives that Jeannie was the key witness to the crime, she had seen, spoken to and travelled with the man who likely brutally beaten, raped and strangled Helen Puttock. Jeannie’s recollections of the evening were excellent and detectives were confident that it was only a matter of time before they had their killer behind bars. Jeannie remembered that ‘John’ had worn some sort of metal badge on his lapel which he fingered continually. She felt that he was almost trying to hide it from the group, but also sensed that his persistent touching of it meant that it gave him a sense of authority. On November 4th 1969 The Glasgow Herald reported: ‘Bible Quoting’ Man Sought By Murder Hunt Police. In it, a description of the killer was issued: ‘A man aged between 25-30, 5ft10 to 6ft tall, of medium build, with light auburn reddish hair, styled short, and brushed to the right. He had blue grey eyes, nice straight teeth with one tooth on the upper right jaw overlapping the next tooth, fine features, and is generally of smart modern appearance. He is dressed in brownish, flecked single breasted suit, the jacket of which has three or four buttons and high lapels. He has a knee length brownish coat of tweed or gabardine, a light blue shirt and a dark tie with red diagonal stripes. 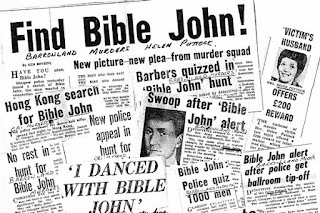 Journalist John Quinn claims to be the one to christen the killer ‘Bible John’, he would later report: ‘With the detailed description rushing around in my head, I ran from police headquarters that day to catch the latest deadline using my radio phone in the car. 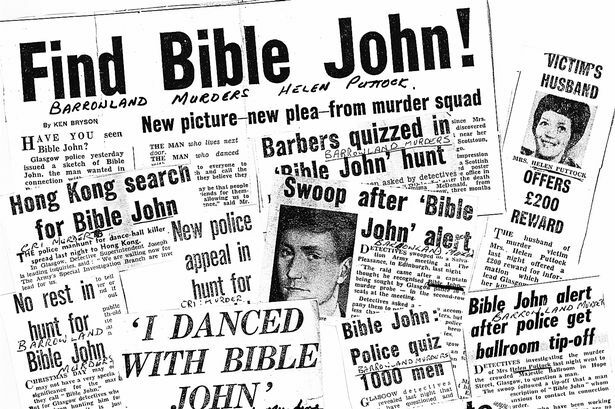 Advising my new editor of the facts, I said: “Let’s call him Bible John.” And so the name that was to haunt the city and inspire fear for decades to come was coined and a legend had begun.